For the holidays, here are some toothpicks that you can use to label foods according to if they contain meat (bacon! ), are suitable for vegetarians, or have some potential allergen for one of your guests. The images at the tops of the toothpicks were extruded from files found in an icon pack at findicons.com after tracing a bitmap and then exporting to .svg format in Inkscape. Settings: MakerWare .3mm/low on a Replicator 2, with about 2 minutes per toothpick if your nozzle is already heated. 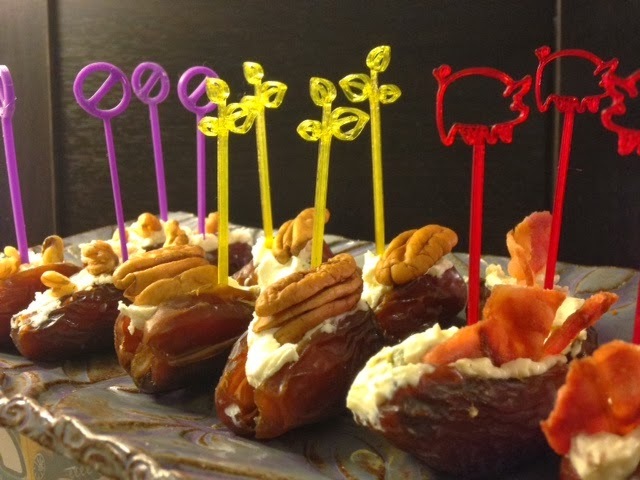 Technical cooking notes: These are dates stuffed with various kinds of cheese. The ones with the purple allergy tag are filled with honey-fig goat cheese and walnuts. The ones with the vegetarian leaves are stuffed with plain cream cheese and pecans. The ones with the pig toothpics have jalapeno-bacon cream cheese and bacon.